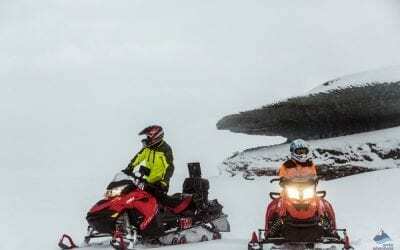 This tour offers extraordinary views and great fun, riding a snowmobile on Iceland’s second largest glacier with the added highlight of a visit to a magical natural ice cave! 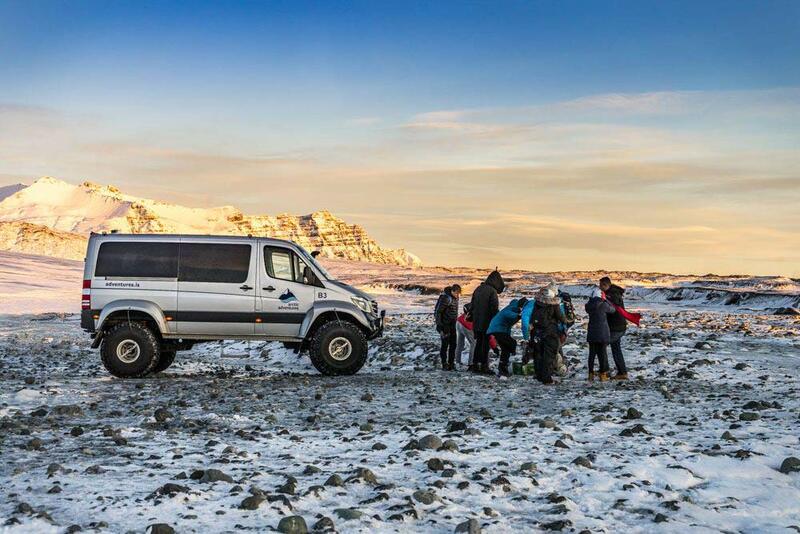 Your adventure day starts we pick you up at the arranged time in our glacier super truck from Gullfoss Café, located beside the famous Gullfoss Waterfall. 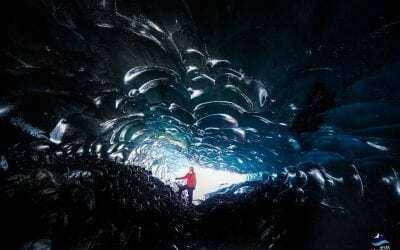 From there you will head up to Langjökull Glacier, Iceland’s second largest glacier, located in the Icelandic highlands. On a clear day the views are incredible. You will be able to see Eiríksjökull Glacier (the highest mountain in west Iceland), Hofsjökull Glacier and also the Kerlingafjöll mountains. 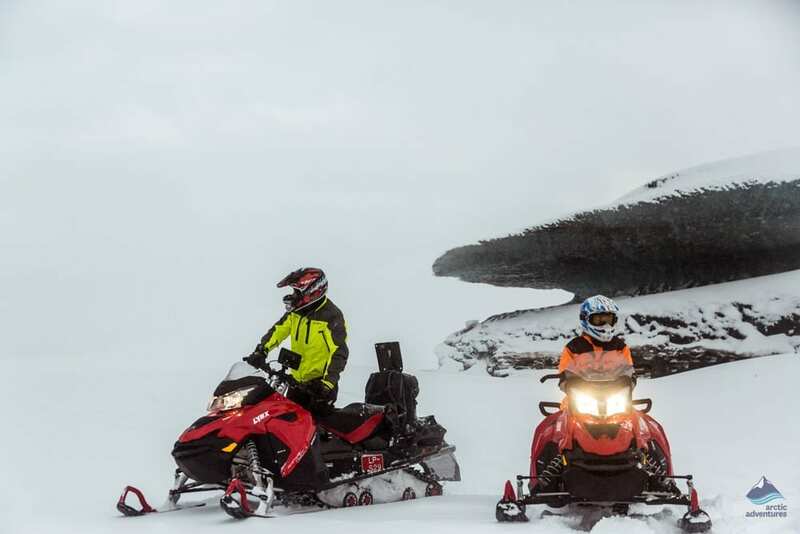 Your certified glacier guide will provide overalls, helmet and all the gear you need, give you a safety briefing and a few straightforward snowmobile driving instructions. You are then ready to ride – driving a snowmobile is easy but feel free to ask any questions before you roar off. 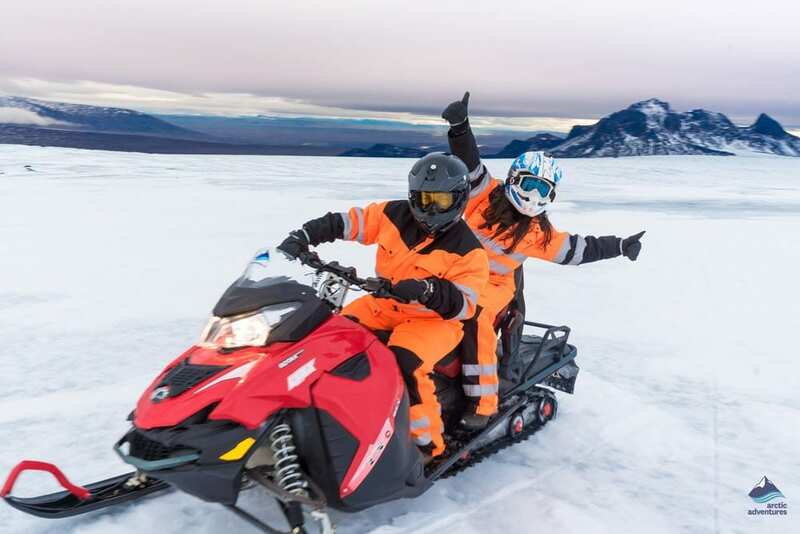 Your stunning 1 hour snowmobile ride will take you across Langjökull Glacier, the second largest glacier in Iceland, rising to 1450 m above sea level. Feel your excitement and adrenaline soar! Your snowmobile tour on Langjökull will feel like a magic carpet chase across the roof of majestic white land. Langjökull is known as ‘The White Glacier’, glaciers are predominately white but Langjökull is just so incredibly white. Make the most of the journey but feel your spine tingle in anticipation as you approach the natural ice cave – you will not be disappointed. 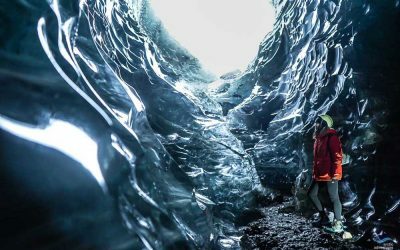 Before winter comes our glacier guides begin their exciting search for the new Langjökull Ice Cave. All ice caves are really special but some are more special than others! 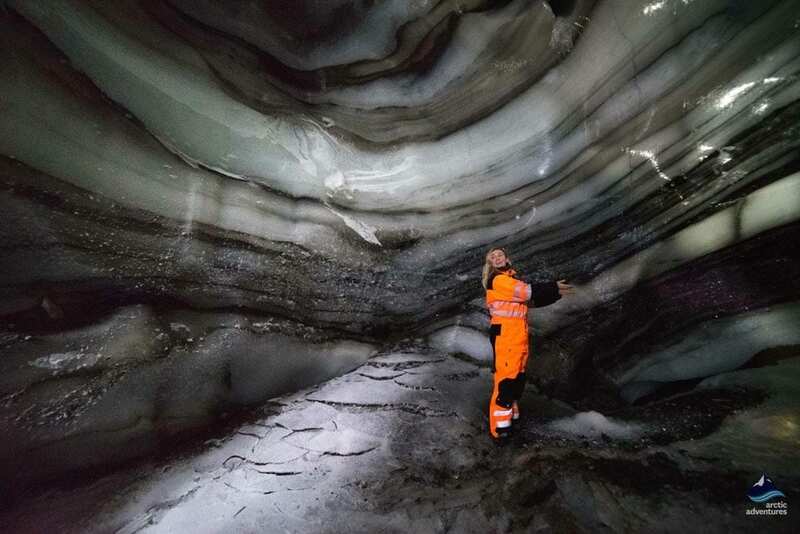 This year our Langjökull Ice Cave is a totally spellbinding stunner – we can absolutely promise you that this is the best ice cave yet. 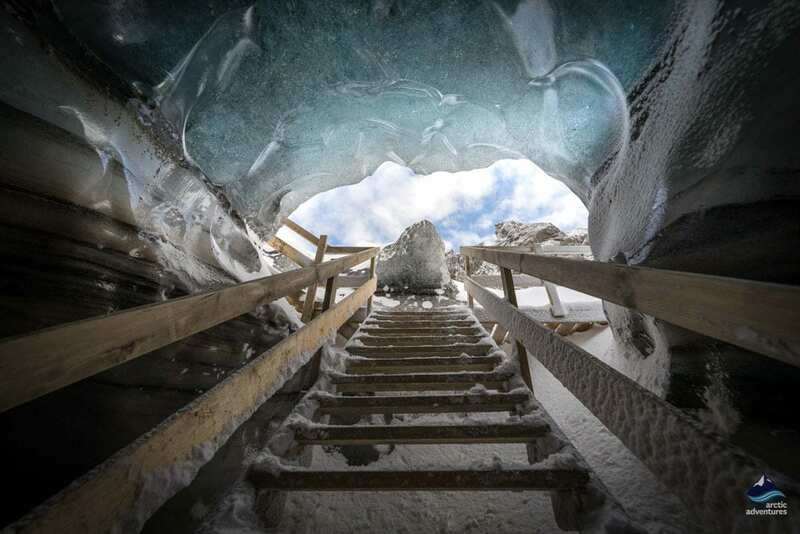 Remember, this is ‘The White Glacier’, well, our Ice Cave displays the most amazing bright jewel blue ice imaginable. The ice-ceiling above you resembles a brilliant blue river, the ice is so exceptionally translucent, it seems as though you are surrounded by pure blue-hued quartz crystal jewels. The ice around this ‘blue river´ is white, bearing very unusual subtle gray ‘zebra striping’, formed from the ash layers of various volcanic eruptions. 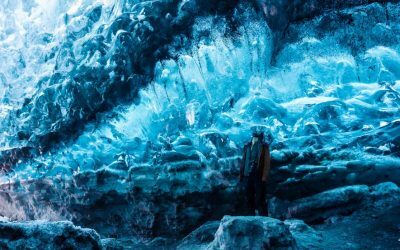 You get about 15 minutes to explore and photograph the cave and to enjoy the rare and precious crystalline blue beauty of this amazing natural ice cavern. 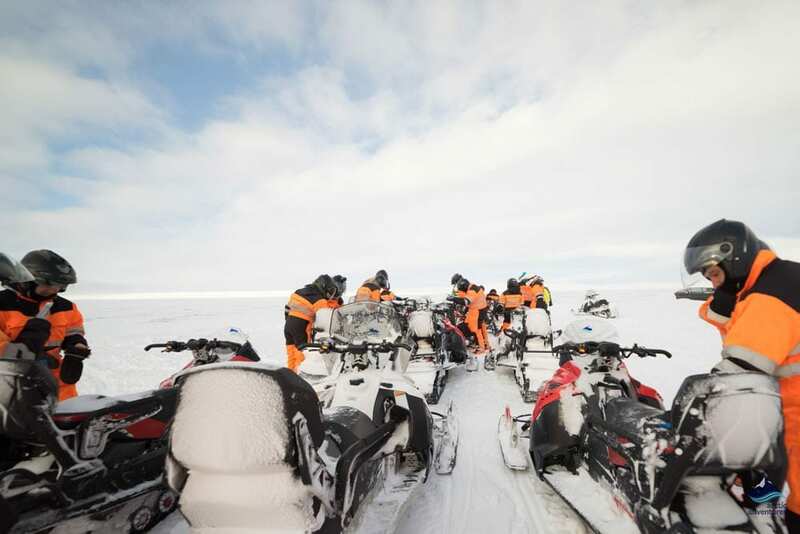 Outside, your trusty snowmobile is waiting, ready to skim you across Langjökull to our Snowmobile Base Camp. We drop you back to Gullfoss Café. 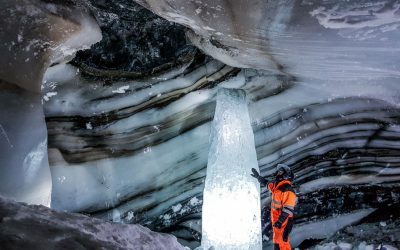 The Glacier Snowmobiling and Ice cave tour from Gullfoss is a really great way to experience all that Icelandic glaciers can offer. Please note: Two people ride each snowmobile. If you are on your own or you wish to ride solo you need to book this and pay an upgrade. All snowmobile drivers need to bring a valid Driving License. What to bring: Warm layers, weatherproof top layer, headwear, gloves, scarves and sturdy hiking shoes. Warm overalls are provided. Price from: 25.990 22.092 ISK per person. THIS WAS AN AMAZING EXPERIENCE! ONE I WILL NEVER FORGET AND HIGHLY RECOMMEND THIS COMPANY TO ANYONE WANTING TO SNOWMOBILE TO THE ICE CAVE. I WOULD LIKE TO RECOMMEND ALLOWING MAYBE 15- 30 MINS IN A ROPED OFF AREA TO FREE RIDE. What an experience! It was a very exciting super jeep ride in the snow, followed by a snowmobile ride to the natural ice cave. Once inside the cave, the air was so pure! We went on the super truck, Snow mobile and ice cave adventure and it was a brilliant trip. The collection was slightly late due to the bad weather but an instructor was there to meet us and explain. We were then concerned our trip would be cut short but the guides were amazing and stayed out later for us to get the full experiance. I cannot recommend this trip highly enough and out of everything we did on our visit I think this was the best one by far. This tour was a great experience, with one downfall. The tour guides are friendly and fun, the tour feels safe and well organised and the scenery outstanding, however this is not small group tour by any means as the website advertises. I would estimate approx. 25-30 people on our tour with at least 15 snowmobiles. This made the tour less fun as some people are more competent on a snowmobile than others and there is a lot of waiting around. Although the ice cave was stunning, it was extremely cramped with some many people and only about space for 8 to stand. 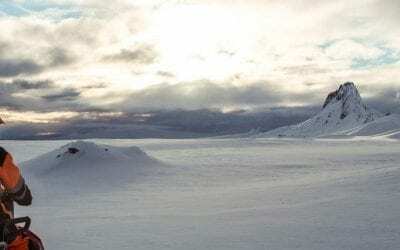 The drive to basecamp was a bit bumpy because of the road condition, but Arctic Adventures can't do anything about that. Nice welcome at basecamp and a quick change over into overall. Good explenation of the working of the snowmobiles and they looked pretty new and well maintained. The group was large (about 17), but there where enough guides riding alongside. Althoug traveling in a large group, you could take your own pace. Nice to see the ice cave. And when we came back to basecamp there was something warm to drink. Overall a nice experience. I visited Iceland with a group of 15 friends and every single one of them said this activity was their favorite of the trip. 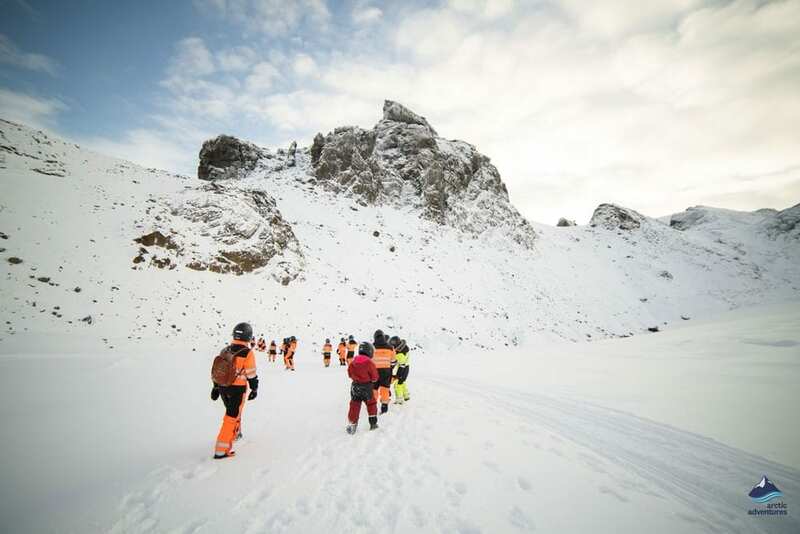 It's quite an adventure but Arctic Adventures is incredibly safe and professional. I could not recommend this activity highly enough and there isn't a better operator to book through. If you are contemplating a snowmobile tour, I assure you it's worth every penny. We had a fantastic time with Arctic Adventures. Our guide, who looked like Chris Hemsworth, so my daughter said, was fantastic. He was quite humorous, and made the drive to the glacier even more enjoyable. Everything went as planned and was quite exciting. 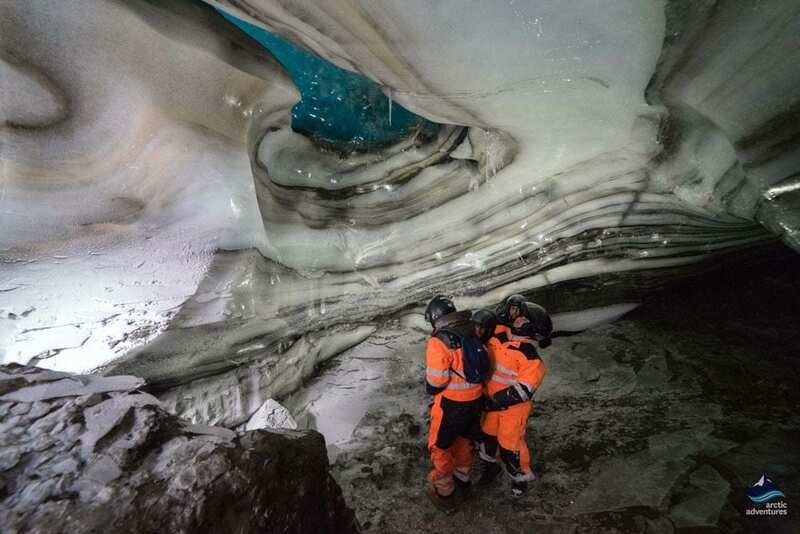 We went inside a real glacier ice cave, which was amazing. 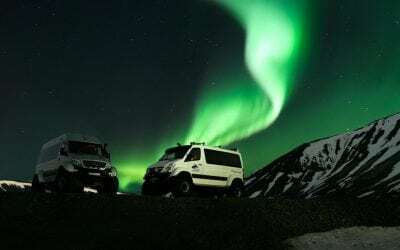 I highly recommend this tour and Arctic Adventures. This has been an crazy awesome experience. Just can say THANK YOU to Scoolje and his colleagues. Who where all kind, friendly, sympathetic and of course very professional but in a funny way. All you need is supported, clothes, Glases, helmets, gloves. You actually don’t need anything to bring along by your own. The weather was cloudy, when we did the tour, but though a lot of fun! 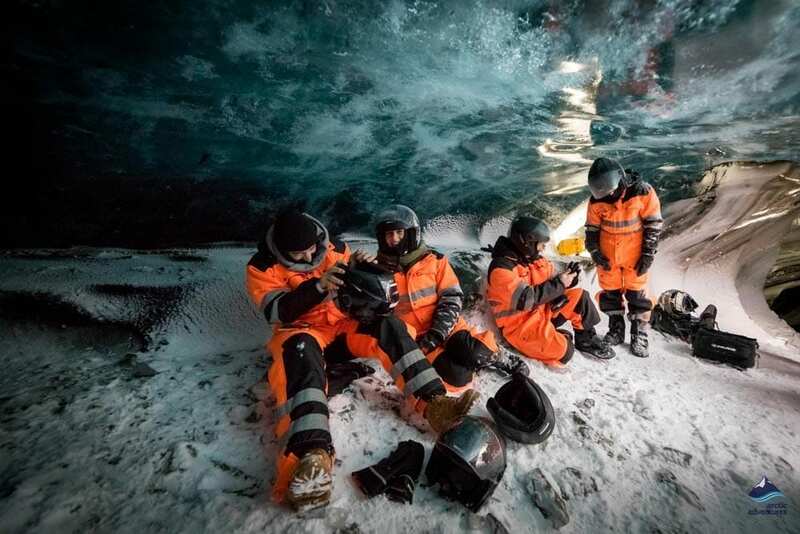 The icecave visiting has been an impressing experience. Would recommend this tour with these guys! Everything went well with the tour itself and I had a great time. The guide was friendly and knowledgeable and a great driver for the paths we had to go through. However one thing disappointed me and it was to wait about 40 min after the scheduled time at gulfoss, mainly because we weren’t advised on such a delay as the other lady from a company would only say “your guide would be here soon, please wait by the cafe”. Soon was after 40 min, time that we could have taken to go and see the waterfalls which we ended up missing because we didn’t have more time to go there and would have missed if the tour started on time but as it didn’t start on time it felt just a waste of time standing in front of the cafe thinking the guide would arrive any minute when we could have gone to the waterfalls. I don’t think it would that difficult to know the guide would still take over half an hour and would have been much better to know this in advance. Just saying this so you can improve in this way for future. Other than the tour was great. Rita. Very pleased with tour. great equipment. beautiful on top of the glacier. The snowmobiling tour is an absolute blast! This was the highlight of our Icelandic adventure, and I cannot recommend it enough. The drive with the superjeep on almost snow blocked roads and offroad was fun (combine the landscape, the gigantic car and Metallica on the stereos and you have an otherworldly combo that makes you feel like you were in an action movie). Our guides were excellent, riding the snowmobile was fun (even though a bit slow at times especially on the way to the cave) and a hot cup of tea was a perfect way to end the drive). I was expecting the ice cave to be bigger and to have more blue ice and more space to explore it, so that did not live up to my expectations (I found the photos on your website misleading). But still cool to see and the rest of the tour was just perfect. Best experience ever! Would definitely do it again if i go back to Iceland! Cory and the team couldn’t have shown us a more amazing experience. Drive to the Glacier was fun, informative and off road in some pretty fresh and deep snow. Snowmobiling was amazing, fast and landscape and scenery was pretty spectacular. The kids had a ball and the guy who led the Cave walk and talk was funny and informative. He also took his skidoo up a near vertical mountain which was pretty cool to watch. The kids said it was one of their top 3 adventures in Iceland. Thanks everyone at Arctic Adventures. This is a must do while in Iceland! It was a last minute decision to take advantage of this excursion. Well worth the money. The whole experience was great, the guides even make it more fun. Well organized, experienced tour guides, great equipment, beautiful tour on the glacier and the ice cave was a nice break in the middle. The hot coffee, tea, cocoa and cookies was a surprise treat at the end. Everything about this trip was amazing from the minute we stepped foot on the jeep that took us to the Galcier! The guides were so friendly and informative, the snowmobiling was out Of this world and so much fun! We loved the ice caving and it is something we will probably never get the chance to experience again. We feel so privileged to have experienced such an amazing trip and it really did make our whole holiday! 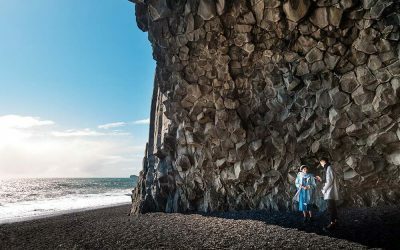 Everyone who visits Iceland MUST do this trip! My family of 4 (including children 8 & 11) loved our snowmobile excursion!! The views were unreal. We felt like we were on another planet. It was the highlight of our trip. I highly recommend this tour!! Everything was great from.start to finish. The huge off-road minibus that collected us to bring us to basecamp was great fun. Tour guides were knowledgeable, friendly and enthusiastic. All equipment was fresh and of high quality. I'd definitely recommend this trip to anyone...it's a once in a lifetime experience! Everyone we met from Arctic Adventures were amazing. Extremely knowledgeable and friendly!! Must see and do during a trip to Iceland! 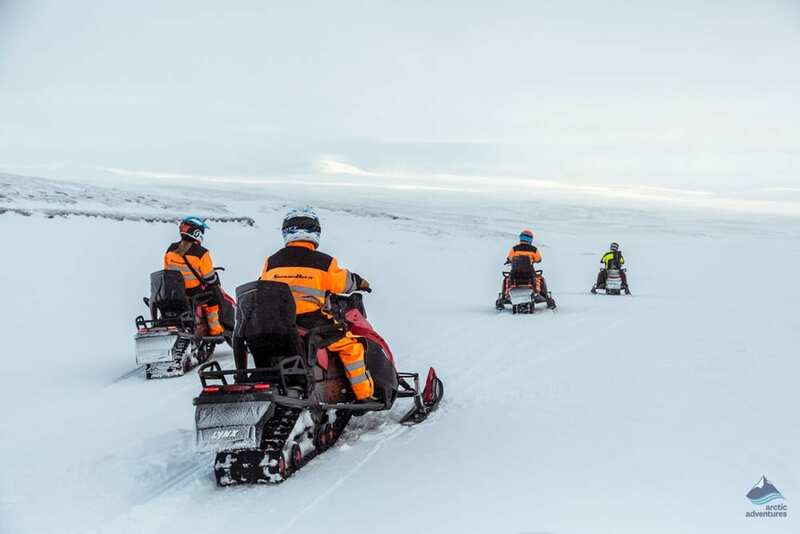 Our snowmobiling and ice cave tour with Artic Adventures was top notch from the beginning where they picked us up from Gullfoss Café in a Super Jeep and we started our adventure up the Glacier. The ease and knowledge of our tour guides was comforting and made us all feel we were in good hands and as though we were just a group of good old friends. I would recommend Artic Adventures for any excursion they offer and know that your safety and FUN are their #1 priority.